1.3 What is the function of lecithin? 1.4 Where does lecithin come from? 1.5 Industrial properties of lecithin? 1.15 Does soy lecithin make you fat? 1.16 Is soy lecithin safe? Lecithin is a fatty substance group of yellow-brown color. Its membership consists mainly of choline, glycerol fatty acids, and phospholipids. Lecithin is in the cells of animals and plants, as well as egg yolk. In animals it appears throughout their whole body but is more evident in brain cells, nerve tissue and white blood cells. Lecithin provides elasticity to cell membranes and protects them from the destructive effects of the free radicals. The word lecithin comes from the Greek “Lekigos” which means “yolk” because it was first isolated from egg yolk. Its discoverer was Maurice Gobley in 1850. 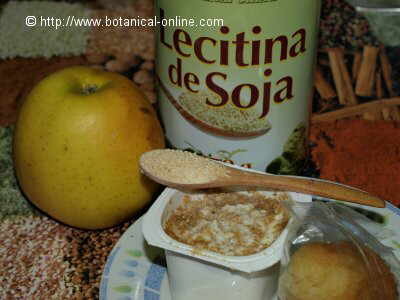 What is the function of lecithin? Sometimes, when we speak of lecithin, we simply refer to phosphatidylcholine one of the major phospholipid lecithin. Lecithin or oil extracted from seeds, mainly from soybean seeds, as shown in the picture – or sunflower. Note the grainy look of it. Lecithin facilitates the flow of nutrients into cells. Good levels of this component, ensure that the heart, the liver or brain can work properly. Where does lecithin come from? In animal foods, eggs and liver are high in lecithin. Brazil nuts contain the highest amount. When Gobley isolated lecithin from egg yolk considered it the substance that was able to mix oil with water. This is possible thanks to the emulsifying properties of this compound. Emulsifier is considered any substance that allows emulsions, that’s to say a homogeneous mixing of two substances that by themselves could not mix, like water and oil. The properties of lecithin are exploited in the food industry to make food products in which the components can be mixed to form a homogeneous mass. Thus, lecithin appears in the formula of many products made by the food industry, such as chocolate, ice cream, cakes, processed cheeses, prepared salads, sweets, etc. 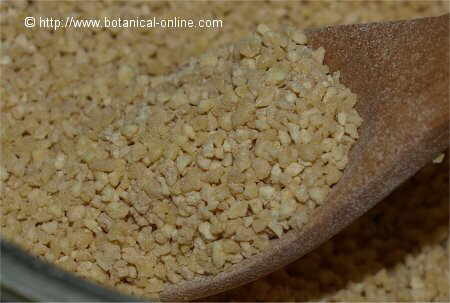 Lecithin is also used in food industry as a stabilizer and as an antioxidant. Soybean lecithin supplements are very interesting for people’s health. Cholesterol can not dissolve in normal conditions and sticks to the walls of the arteries, eventually produces artery hardening (atherosclerosis) and the increase of the arterial tension (hypertension). Soy Lecithin is rich in phospholipids (phosphatidylcholine, phosphatidylethanolamine, phosphatidylinositol and phosphatidic acid). These components allow to emulsify, that’s to say, mix, fat body with water, thus enhancing its removal. All this means that the intake of soy lecithin is adequate to prevent the formation of cholesterol and other lipids that become more liquid and are not attached to the arteries. The use of soy lecithin promotes circulation and prevents blood clots in the arteries, which prevents heart attacks and other circulatory diseases. Lecithin is an emulsifier found naturally in bile. Its function is to wrap the particles of fat and cholesterol, to form an emulsion that will allow the fats to be absorbed. To provide the soy lecithin organism is to give it the same natural emulsifiers that it uses. This supplement is very convenient especially for people with fat digestion problems and those who do not have a gall bladder (cholecystectomy). The main components of lecithin are choline and inositol, which are part of their phospholipids. Choline therefore comes from the degradation of phosphatidylcholine (a type of lecithin), and inositol is derived from phosphatidylinositol (another type of lecithin). By ingesting soy lecithin, the body can transform soybean lecithin into choline and inositol. 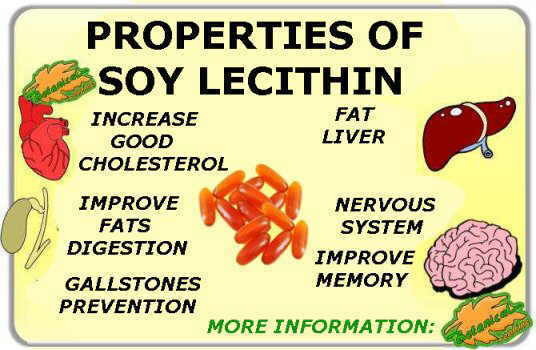 Therefore, soy lecithin provides these two active ingredients very interesting for health. With these components the body produces acetylcholine, a substance that acts as a neurotransmitter of the nervous system. 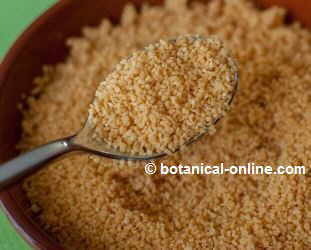 The use of lecithin is very interesting for the prevention or treatment of many diseases of the liver. This component, to be able to metabolize fats, prevents these are deposited in the liver. Thus prevents the occurrence of fatty liver disease. At the same time, lecithin transports lipids from the liver to cells and enhances their penetration into them. All of this metabolic process drags a high amount of toxins which is a liver cleanse. It has been shown that lecithin helps the liver to prevent or treat a variety of diseases that can affect you as cirrhosis, hepatitis, liver cancer or the degradation of the liver caused by toxins. Lecithin might be useful in preventing the development of Alzheimer although there is no conclusive evidence on this issue. It is also thought that could help to improve memory, increase concentration and be a good supplement in cases of hyperactivity. All this responds to the fact that lecithin is part of the brain neurotransmitters and is necessary for the proper functioning of the nervous system and its connections. Very interesting scientific studies support the properties of choline supplementation for the reduction of homocysteine levels. High levels of homocysteine correlate with increased cardiovascular risk, being a better indicator even than bad cholesterol. Lecithin contains a lot of vitamin E, a fat-soluble vitamin used for the correct preservation of this supplement. This vitamin is one of the most potent antioxidants, able to counteract the negative effects of free radicals on the circulatory system, the health of the mind or sight. However, the presence of this vitamin in the supplement is for the preservation of the product itself. Does soy lecithin make you fat? 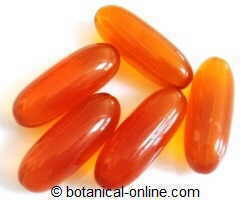 Lecithin is sold in capsules, ampoules or granules. The usual dose of lecithin in capsules or blisters usually about 2200 mg a day divided into two doses with meals. The equivalent of this dosage is a couple of teaspoonfuls in the form of granules one at breakfast and another meal. This is sprinkled over the plate, add to yogurt or in orange juice. Soy lecithin is not a food but as a supplement to be taken in moderation. Consider that a mere teaspoon of this supplement provides 34 Kcal derived from fat content (4.5 g approximately). Fortunately the largest proportion of these are polyunsaturated and therefore is very beneficial for health. One tablespoon provides over half of the dose of vitamin C.
There is desirable not to overcome the dose of a couple of teaspoonfuls a day, because in this case, it could be harmful. In usual doses, there have been no cases of toxicity. In high doses, it commonly cause adverse reactions with onset of abdominal bellyache, diarrhea, sweating or vomiting. Because no sufficient studies have been performed, it should not be given to pregnant women or infants. Similarly, in case of illness or medication, consult your doctor if you should take this supplement.